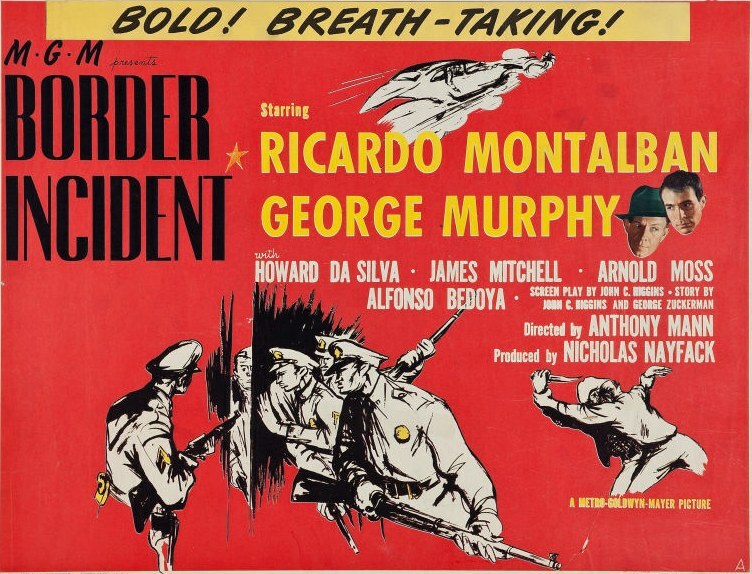 If you think that Mexico-U.S. border security and illegal immigration are relatively new issues, check out Anthony Mann’s Border Incident. Watching it today, it’s remarkable how familiar the social and political backdrop feels. Border Incident is a fictional film, but it’s a composite of actual cases. It begins with the stentorian narration that opened nearly every docudrama from the 1940s, and explains how important migrant labor from Mexico is to the U.S. agricultural industry. The narrator goes on to say that while the vast majority of Mexican farm workers play by the rules, wait their turn, and arrive in the United States with working papers, some go through back channels and slip across the border in order to work illegally. The police officers on the front line of the operation are Pablo Rodriguez (Ricardo Montalban) and Jack Bearnes (George Murphy). Pablo and Jack have worked together before and have an easy friendship, but they don’t get much time together onscreen in Border Incident. Meanwhile, Pablo goes undercover as a migrant laborer looking to put himself at the mercy of the human traffickers who transport desperate men in dangerous and cramped conditions. Will his soft hands give him away? You’ll just have to watch the movie to find out. 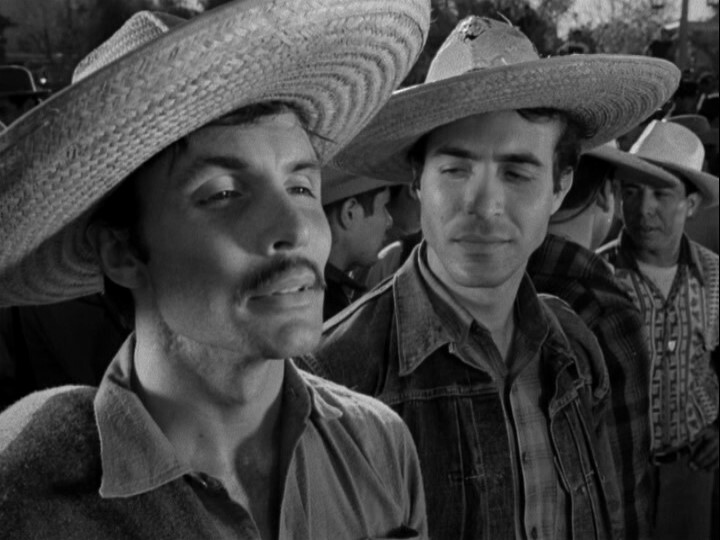 Border Incident was one of the last films Anthony Mann made with cinematographer John Alton. Earlier in their careers, Mann and Alton made two of the most visually innovative noirs of all time; T-Men (1947) and Raw Deal (1948). I didn’t find Border Incident quite as involving as either T-Men or Raw Deal, but visually it’s every bit the equal of those films, maybe even better. It’s full of deep-focus photography that frames two people’s faces — one in the foreground and one in the background — in a way that dials up the tension and paranoia. Day-for-night shooting rarely looks good, but Alton makes it work in Border Incident, which is replete with stunning desert landscapes that are dominated by jagged mountains and that have a sense of claustrophobia despite taking place outdoors. Minor quibbles aside, however, Border Incident is a top-notch entry in the film noir docudrama genre. It’s a tough, tense, violent film that features extremely impressive cinematography and continually mounting tension. It also made me wonder what Orson Welles’s masterpiece Touch of Evil (1958) would have been like if Ricardo Montalban (an actual Mexican) had been cast in the lead role instead of Charlton Heston (a fake Mexican). Posted in 1949, October 1949 and tagged Anthony Mann, Border Patrol, Charles McGraw, Docudramas, Film Noir, George Murphy, Howard Da Silva, Illegal Immigration, James Mitchell, John Alton, Metro-Goldwyn-Mayer, Ricardo Montalban. Bookmark the permalink. This movie grabbed me with its first frame and never let go. They Live by Night is unlike any other movie I’ve seen so far from 1948. Obviously I know what lay ahead for its director, Nicholas Ray, but even if I didn’t, this is the kind of film that would make me sit up and take notice of his name, and look forward to seeing everything he directed next. Come to think of it, my knowledge of Ray’s filmography is pretty spotty. In high school, Rebel Without a Cause (1955) was one of my favorite films. I watched it over and over, but never thought to explore more of Ray’s films. Years later, I saw In a Lonely Place (1950) and loved it, but didn’t make the connection that it was the same director who made Rebel. But now I’ve got so many Nicholas Ray films to look forward to! 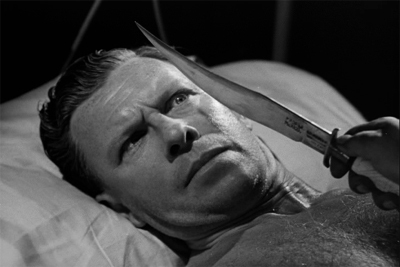 Like all innovative films made more than 50 years ago, They Live by Night doesn’t contain anything we haven’t seen in hundreds of films since, but when viewed in its proper context, it’s exhilarating. Just look at the opening of the film. 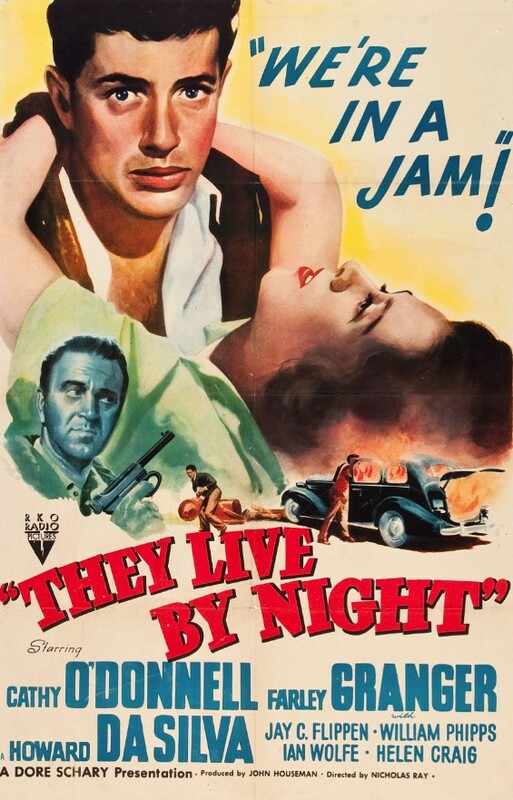 Unlike nearly every other film of the era that began with a title card followed by a credit roll, They Live by Night begins with shot of two deliriously happy young lovers as the following words flash on the screen: “This boy… and this girl… were never properly introduced to the world we live in… To tell their story…” And suddenly the music becomes grim and portentous, we cut to a shot of a speeding car, and the film’s title appears. The speeding car is filmed from a helicopter, and it’s the earliest instance of action shot from a helicopter that I’ve seen in a film. It’s just one of the innovative ways that Ray creates tension, drama, and excitement with filmmaking techniques that are common practice now, but that were revolutionary at the time. They Live by Night was based on Edward Anderson’s novel Thieves Like Us (1937). Farley Granger plays a young man named “Bowie” Bowers (his first name is pronounced “Boo-ee,” just like Jim Bowie). When the film begins, he’s an escaped con running from a murder sentence, and his luck will only get worse as the film goes on. Except for one thing. He falls in love with a young woman named Keechie (Cathy O’Donnell), and while they’re on the run together, they’re happy as only two young people in love can be happy. There are obvious comparisons to be drawn with Joseph H. Lewis’s Gun Crazy (1950) and Arthur Penn’s Bonnie and Clyde (1967). They Live by Night shares the Depression-era setting with Bonnie and Clyde, and it’s visually similar to Gun Crazy, but unlike both of those films, Keechie isn’t an active participant in any criminal activity and the film focuses more on her romance with Bowie than it does on Bowie’s crime spree. Ray makes so many surprising and smart choices in this film. He doesn’t show most of Bowie’s bank robberies, which focuses our attention on Bowie’s romance with Keechie. His crime spree across Texas is a matter of grim necessity, and all he wants to do is escape. This has the effect of making a radio news report about Bowie’s growing infamy surprising to the audience. Ray makes it easy to forget much of the time that Bowie is a criminal, which make the intrusions of hard reality into Bowie and Keechie’s lives all the more shocking. Ray also has a knack for depicting life in a way that feels authentic. Even minor characters with just a few lines feel like fully realized, three-dimensional people. When Bowie and Keechie go to a nightclub on a date, the African-American singer Marie Bryant does a rendition of “Your Red Wagon” and collects dollar tips from the crowd, which she folds and clasps between her fingers. Most Hollywood productions would never show a nightclub singer taking tips — it would ruin the illusion of glamour. But the nightclub in They Live by Night looks and feels like a real place. When Bowie goes into the men’s room, he has a brief conversation with the African-American bathroom attendant. In a lesser film, the attendant would be comic relief, and in a lower-budget film, he wouldn’t exist at all. They Live by Night features top-notch work by all of its cast and crew. Leigh Harline’s music (with uncredited assistance from Woody Guthrie) is phenomenal. George E. Diskant’s cinematography is some of the most beautiful and most noirish I’ve ever seen (they really do live by night in this movie), and Sherman Todd’s film editing is soothing when it needs to be and jarring when it needs to be. Todd and Ray made a lot of risky choices in the editing room, but for my money, they all paid off. Ray filmed They Live by Night in 1947, but RKO wasn’t sure how to market the film, and it ended up premiering in the United Kingdom in a single theater on August 5, 1948. It wasn’t released in the United States until November 1949, and didn’t end up being a financial success, but it had been screened privately in Hollywood for many actors and producers, which led to Ray’s next film, Knock on Any Door (1949), with Humphrey Bogart, as well as to Farley Granger being cast in Alfred Hitchcock’s Rope (1948). Posted in 1948, August 1948 and tagged Cathy O'Donnell, Farley Granger, Film Noir, Howard Da Silva, Nicholas Ray, RKO Radio Pictures. Bookmark the permalink. 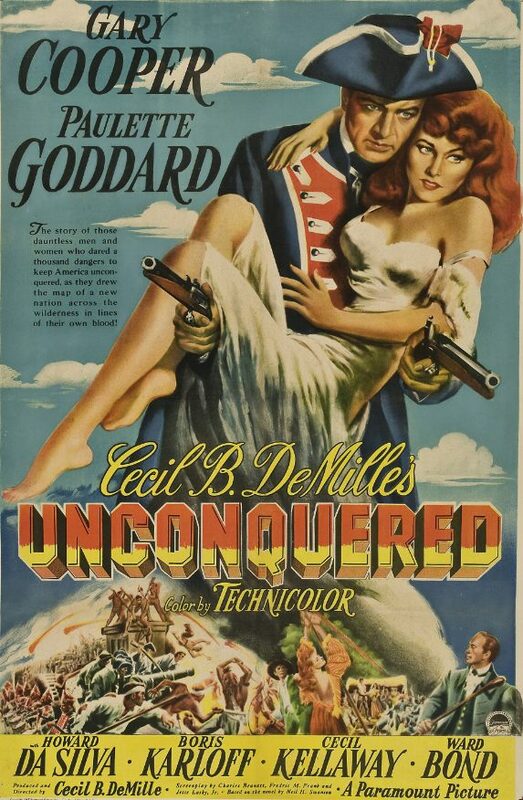 Cecil B. DeMille’s Unconquered is an overblown, bodice-ripping Technicolor epic that’s equal parts high drama and high camp. It’s also a whole lot of fun. Most of the money shows up on screen, though. This is a great-looking picture. It drags a little in places, but for the most part it’s a fun ride. There are a few standout action set pieces — like a canoe chase that ends with a drop straight down a waterfall — but the talky bits are pretty enjoyable, too, even if they’re straight out of a potboiler. Unconquered, which is based on Neil H. Swanson’s novel The Judas Tree, takes place in 1763, when Fort Pitt marked the end of the known and the beginning of the unknown in America. Located where one can now find Pittsburgh, the fort was the last outpost of civilization in the New World, surrounded by a vast forest filled with hostile Indians. A beautiful Englishwoman named Abigail Hale (Paulette Goddard) stands trial for the murder of the royal officer who was killed when she was helping her brother fight off the King’s press gang. She is given a choice, face execution in England or be sold as a bond slave in Norfolk, Virginia. Naturally, she chooses life over death, but life as a bond slave is no picnic, especially when she’s bought by the villainous arms trader Garth (Howard Da Silva). The handsome Capt. 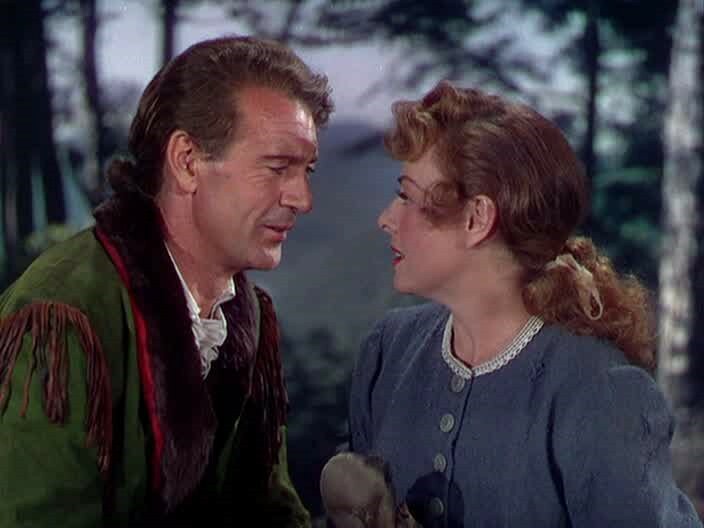 Christopher Holden (Gary Cooper) outbids Garth and then casually gives Abby her freedom, but the treacherous Garth makes a deal with the slave trader to double-sell her and retakes possession of her. Garth’s villainy isn’t limited to his treatment of beautiful white female slaves. He also has a monopoly on the lucrative beaver-fur trade west of Fort Pitt, and will do anything to maintain it, including arming the hostile Indian tribes to prevent white settlement beyond the Alleghenies. The chief of one of those hostile Indian tribes is named Guyasuta, and he’s played by Boris Karloff, who’s always fun to watch. Guyasuta’s medicine man, Sioto, is played by Marc Lawrence, a regular in gangster movies. The scene in which Capt. Holden tricks Guyasuta and Sioto into releasing the captive Abby by using his “magic” compass was the high point of ridiculousness in the film, but in a movie like Unconquered, once you’re along for the ride, the more ridiculous the better. Cooper and Goddard were both a little too old for the roles they were playing in Unconquered, but they were both still extremely attractive, so it didn’t bother me that much. The action in the film is well-staged, especially the final battle for Fort Pitt, which is heavy on the pyrotechnics. Who cares if it’s all a little hokey? No one does epics like Cecil B. DeMille. 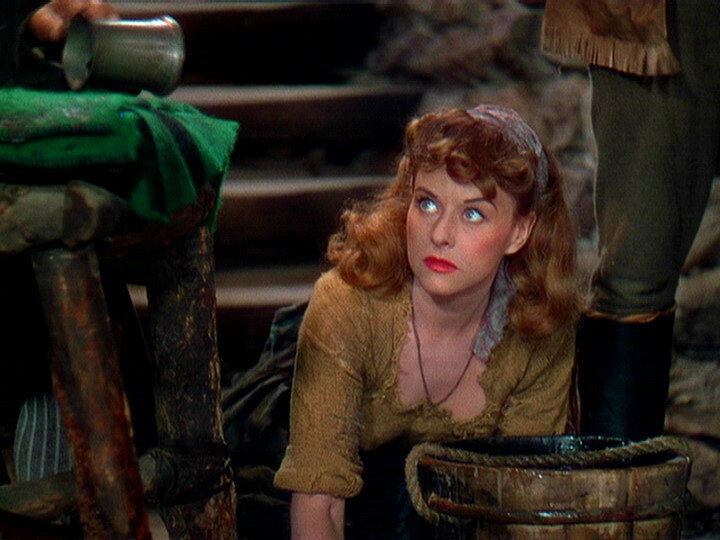 Incidentally, Unconquered was the highest grossing film of 1947, with total ticket sales of more than $6 million. So at least it made its money back. Posted in 1947, October 1947 and tagged Boris Karloff, Cecil B. DeMille, Epics, Gary Cooper, Howard Da Silva, Paramount Pictures, Paulette Goddard. Bookmark the permalink. Don Birnam (Ray Milland) is a handsome, intelligent, and charming man who shares an apartment in Manhattan with his brother Wick (Phillip Terry). After receiving praise for his short stories during his time at Cornell University, Don dropped out before graduation and moved to New York to pursue his dreams of becoming a famous and respected author. Now in his 30s, Don has finished nothing and published nothing in all his time in New York. He has no money and no prospects. He survives on handouts from his brother, and he is an alcoholic. As the film begins, he has supposedly abstained from drinking for several weeks, and is packing for a long weekend in the country with Wick. What his brother and his long-suffering girlfriend, Helen St. James (Jane Wyman), don’t know is that he has a bottle of cheap rye cleverly hidden. It’s hanging out his bedroom window on a string. Wick and Helen are optimistic about Don’s progress, but like so many people who love alcoholics, they are deluding themselves. Although perhaps only partly. When Helen says, “You’re trying not to drink, and I’m trying not to love you,” it encapsulates years of sadness and betrayal. In preparation for the getaway, Helen brings Don a care package with a new James Thurber novel, two Agatha Christie books, cigarettes, and chewing gum. Don is irritable and evasive, however. When Wick talks about looking forward to apple cider in the country, Don snaps, “Why this emphasis on liquids? Very dull liquids?” Wick eventually discovers the bottle of rye hanging out the window and pours it out. Don weasels out of the situation by claiming it was something he hid weeks ago, during a binge, and forget about. He then convinces Wick and Helen to go to the symphony without him, telling them he just needs a few hours to clear his head before they catch their train. His denials and his lies are classic alcoholic behavior, and it comes as no surprise when, as soon as they leave, he turns over the apartment looking for money and anyplace he might have hidden liquor and forgotten about. He finds $10 intended for the cleaning lady and goes to the liquor store to buy two bottles of rye. The proprietor (Eddie Laughton) initially refuses to sell them to him, but it doesn’t take long for him to cave in. “Two bottles of rye!” Don says, showing his money. Milland’s performance as an alcoholic is masterful. Before The Lost Weekend drunks in Hollywood movies were all bums on skid row or comical, hiccupping buffoons who saw pink elephants. No matter how drunk Birnam gets, he never slurs his words. He simply becomes more grandiose and irrational, and more desperate to keep drinking. After he hides his booze at home, he stops in at Nat’s Bar for a few shots before the weekend. After Nat (Howard Da Silva) pours him his first glass of rye, he moves to wipe up the bar. Don then delivers a monologue about his plan to smuggle rye on his weekend. He plans to hide one bottle in a copy of The Saturday Evening Post, so his brother can discover it, which will set his mind at ease. The other will be hidden in his brother’s luggage, and Don will retrieve it and hide it in an old apple tree. He doesn’t need it, he says, he just needs to know that it’s there if he needs it. When the scene ends, Don lifts a glass to his lips, and the camera shows that there are five “vicious circles” in front of him; five rings of booze on the surface of the bar. Back at home, Wick and Helen give up on waiting for Don to arrive, and Wick leaves without him. Helen pleads with him and defends Don. “He’s a sick person,” she says. “It’s as though there were something wrong with his heart or his lungs. You wouldn’t walk out on him if he had an attack. He needs our help!” But both of them–the two people in the world who really care about Don–are at the ends of their ropes. Wilder does not depict Don’s descent into delirium in a purely subjective fashion, but there are a lot of brilliant little moments in the film that put us inside Don’s head. The extreme close-up on Don’s eye as it slowly opens while a phone rings in the background will strike a chord with anyone who’s ever had a crippling hangover, and Miklós Rózsa’s brilliant score, which incorporates haunting melodies played on a Theremin, mirrors Don’s altered mental states. The Theremin would become ubiquitous in science fiction films in the ’50s, but in 1945, most Americans had never heard the instrument before, and it must have sounded incredibly eerie. The rubber bat that Don imagines he sees in his apartment is less effective, however. But The Lost Weekend is still a brilliant film, and remains one of the most honest portrayals of addiction ever put on film. When I first saw it years ago, I thought it had a happy ending. Watching it now, I’m not so sure. Don’s promise to stop drinking and finish his novel could just be one more lie; one that the audience itself wants to believe because the alternative is unbearable, that Don’s life is the vicious circle he referred to in Nat’s Bar, and that there is no hope for him. After all, Charles R. Jackson, whose semi-autobiographical novel was the basis for this film, did eventually commit suicide. 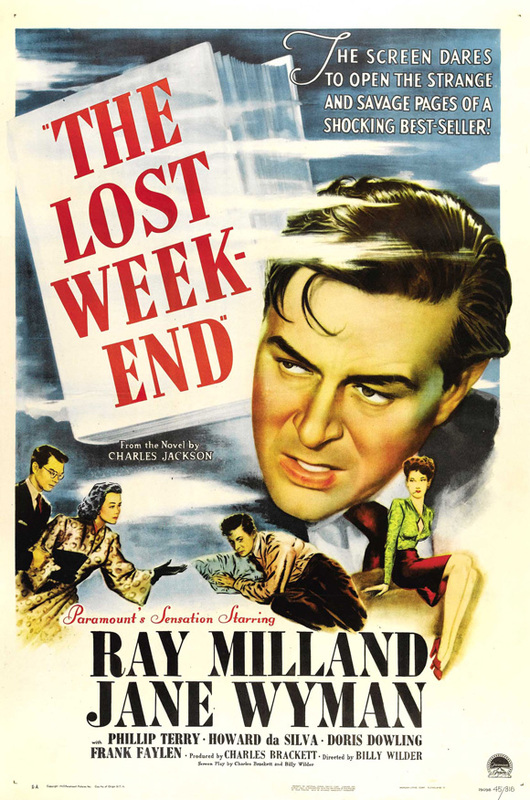 Paramount Pictures was initially reluctant to release The Lost Weekend. They were encouraged to bury it not only by the liquor industry, but also by temperance groups who felt the film would only encourage drinking. Critics loved it in limited release, however, so Paramount released it in theaters nationwide, and it went on to win numerous awards. The Lost Weekend is the only film to win both the Academy Award for Best Picture and the Cannes Film Festival Grand Prix du Festival International Film. Milland won the Academy Award for Best Actor, Charles Brackett and Wilder won the Academy Award for Best Screenplay, and Wilder won the Academy Award for Best Director. Posted in 1945, November 1945 and tagged 18th Academy Awards, Alcoholism, Anita Bolster, Billy Wilder, Charles Brackett, Charles R. Jackson, Doane Harrison, Doris Dowling, Drama, Frank Faylen, Frank Orth, Howard Da Silva, Jane Wyman, John F. Seitz, Lewis L. Russell, Lilian Fontaine, Mary Young, Miklós Rózsa, Paramount Pictures, Phillip Terry, Ray Milland, The Lost Weekend. Bookmark the permalink.